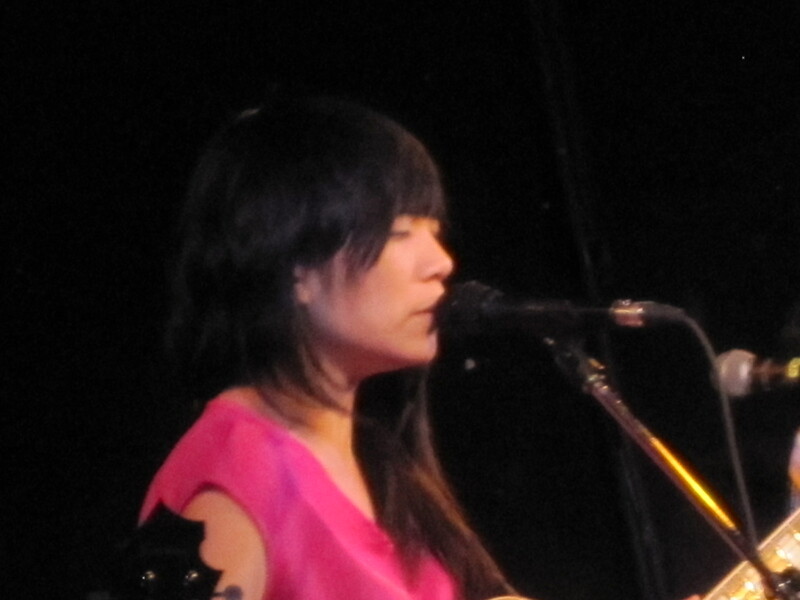 Thao and the Get Down Stay Down: Live in Toronto! 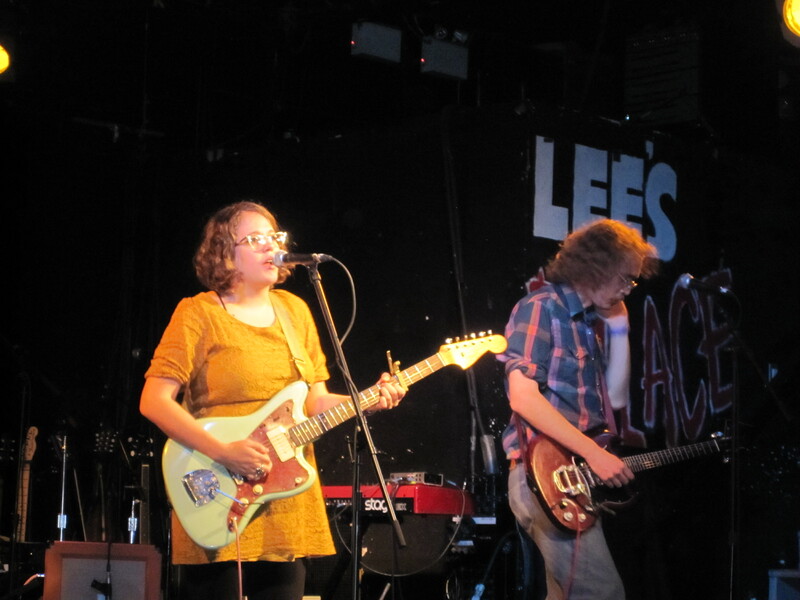 It’s been a couple of months since I was at Lee’s Palace. Lee’s is one of those places where if it’s not full, it seems empty. That said, even though the bar was only about two-thirds full last Wednesday to see Thao and the Get Down Stay Down along with Sallie Ford and the Sound Outside, it felt as if they place was the site of a big party. Sallie Ford comes from Portland, Oregon. Their new album, Untamed Beast, is the band;s second, and is well worth your dollars. The band took the stage about 9PM and for the next fifty minutes led us through songs which ranged from rockabilly to ballads and everything in between. Modest in stage manner, they quickly own over the crowd with unpretentious, straight-ahead rock ‘n’ roll. Headliner Thao and the Get Down Stay Down came on at 10:15. 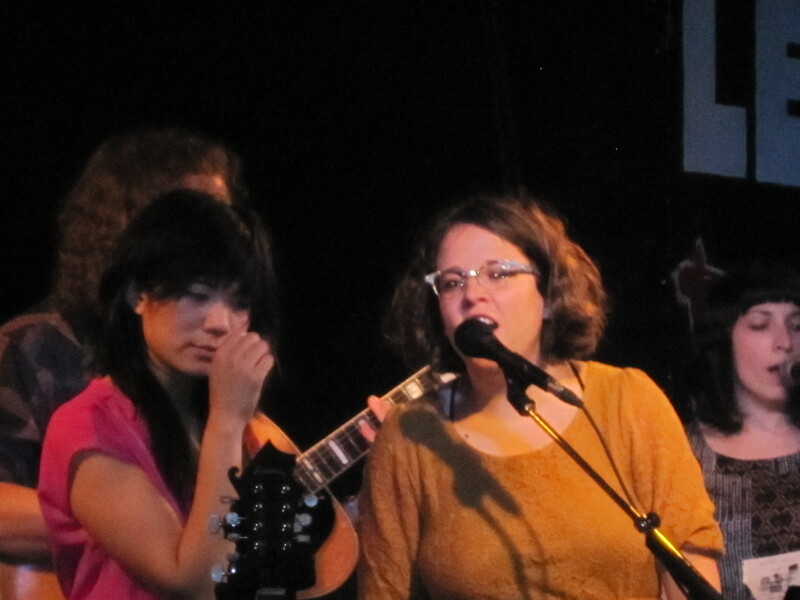 If Sallie Ford was relatively stationary, Thao was the opposite. She never stood still. Bopping and bouncing round the stage while performing songs from her new album We the Common. Thao’s set lasted about an hour, but within a few minutes both bands were back on stage to perform a cover of the Ronettes’ “Be My Baby” and then they were gone. There’s quite a contrast. Sallie Ford the rock ‘n’ roll traditionalist; Thao Nguyen the eclectic. However, both bands put on shows which quietly but effectively pulled in the audience and left us with a warm feeling as we went out into the unseasonably cold night. Huh? That went by quickly. My eldest turned 13 today. Seems like only yesterday we made that terrifying trip to the hospital. Admitted. Birthing suite. Injections. Labour. Delivery. Daughter. Born 3:12 AM. Joy. Coming back later, telling nurse, “I’m here to see my…daughter.” Words in mouth, in ears for the first time. Holding. Weeping. Humbled. Apologizing. First change. Rocking child to sleep. Tears, fears. Steep learning curves. Daycare. Tears. Hers and mine. Kindergarten. School. So proud. Never more than today. How quickly it goes by; how much I left out. To be a parent is to be slightly crazy. You can’t escape it. And our children never notice until they are parents. OK, I liked Boomslang. I thought it was an interesting new direction; also I’m a big reptile nerd. Not a lot agreed. That said, The Messengerr is one of those classic pop records that sounds better with each listen – you just notice new things each time. I don’t want to compare this to that other group Marr was in, sorry – can’t remember the name, but it has that same panicy urgency that made those records so great. OK, Marr isn’t the most memorable singer in the world, but the tunes more than make up for it. Fantastic. OK, I saw Mr. Reznor’s last band on the first Lollapalooza tour. Didn’t much care for them. Did like his soundtrack work (The Natural Born Killers soundtrack is better than the movie). This, I do like. NIN lite? Nah, that’s just snotty, but there’s also a certain truth. HTDA expands the range of emotions beyond rage, self-loathing and despair. And on a song like “Ice Age,” they create something quite lovely. Critics argue that Mariqueen Maanndig’s voice is buried in the mix, but I’d say it functions as another effective instrument. Soaring at times; muted at others. I’m much more excited by this than the prospect of a new NIN record. Huh? This song came out last summer and was a #1 hit in the UK. I heard it on a Joe Fresh commercial. Sickeningly addictive, it’s a Dee-Lite for the 21st century. Not a big fan of Dragonnette’s brand of electronic-pop, nor Mr. Rogers. But this ad announcing Target’s entry into Canada is kind of fun. A nice coffee table collection of (mostly) British punk materials, along with essays by William Gibson, Jon Savage. Linder Sterling, Gee Vaucher and Johan Kugelberg. Pricey but nicey. Great if you weren’t there; nostalgia if you were. Never read the magazine, so this is a good account of the seventies magazine from New York. in an oversized format. Like the previous book, it’s not cheap, but it is worth having. Picked up this book remaindered at a local bookstore chain. Shame it wasn’t a bigger seller, because the subject is quite interesting: the quest for authenticity in popular music. Friends at Troploin have a new text at their site, What Next? It’s published as a pamphlet with an essay by Karl Nesic and another by Gilles Dauve. A few weeks back at work, the name Stephen Finucan came up in conversation. 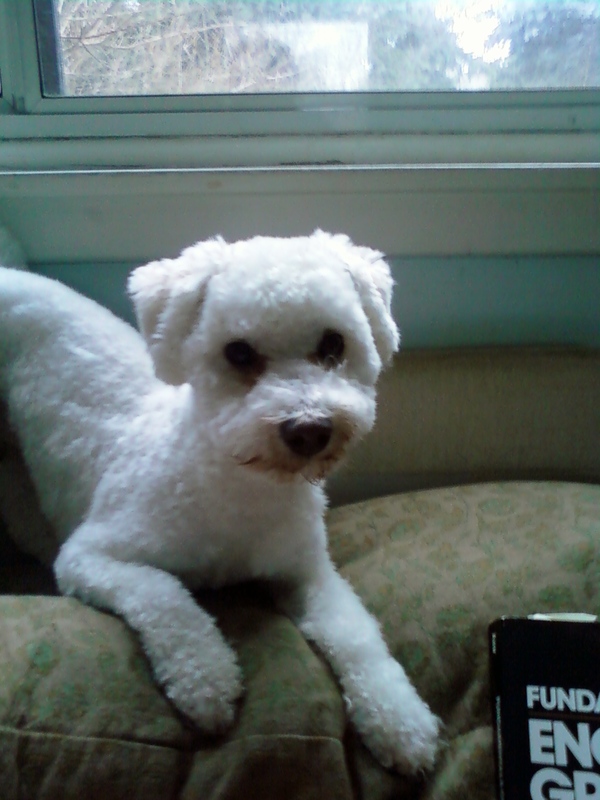 Finucan is a Canadian writer and the author of a couple of books of short stories. I’d worked with him about ten years back and had enjoyed the collections. Wonder if he’s written anything since I thought. He had. In 2009 he published his first novel, The Fallen. Four years is a bit late to be publishing comments, but better late than never. The Fallen is set in Naples after the fall of Mussolini in the time of the city’s occupation by Allied forces. The cast of characters are rich and detailed: A Canadian officer who seeks to atone for a tragic mistake; a philosophizing Godfather-like figure who controls vast swaths of the city’s criminal activities; an upcoming ruthless street thug who seeks to create his own criminal empire; a former communist, now petty criminal whose ideology now involves saving his own skin; an aging museum curator who main priority is to protect his collection; and a girl. All of these characters act and interact in Finucan’s beautifully written story. It takes a little while to establish the story and set the scene, but once this happens the story proceeds to its seemingly inevitable conclusion. It’s not a cheerful book. The air of gloom, of despair fills the pages as it fills the characters’ lives. Yet, there’s a certain haunting grace as people try to be human in the face of a situation where humanity is not encouraged. Phew! Well, that’s a relief; the Catholic Church has chosen a new Bishop of Rome, God’s Ambassador on Earth. Glad that’s over as I felt at a loss for spiritual guidance these last few days. When I sat down to write this post, I was going to trot out my usual caustic comments about religion, but in this case, it’s a bit like shooting fish in a barrel. Instead, I decided to post a series of quotations about religion from A Book of Surrealist Games. “The Priest and the Tyrant share the same policy and the same interests. All either one of them needs is imbecilic and craven subjects. Both are corrupted by absolute power, licence and impunity. Both corrupt – one in order to rule, the other to expiate. They come together to snuff out the light, to crush reason and drive the desire for liberty out of the hearts of men” – D’Holbach. I’ve heard Canadian nationalism referred to as the love that dare not speak its name (yes, yes, I know…). Stompin’ Tom Connors, who died last week dared. He loved Canada and was unapologetic about it. Well, I was a lucky boy and got a ticket to Patti Smith’s sold-out performance at the AGO last week. Imagine that. I first heard Patti’s work (It just feels wrong calling her Ms Smith) in the late 70s. I bought a Sire Records sampler on cassette which featured the Ramones, New York Dolls, Flaming Groovies and the Dead Boys among others. Then, there was this curious thing called “Piss Factory.” Now at the time, I was very much into punk, but “Piss Factory” doesn’t sound punk by most definitions, but it IS punk in spirit though. It’s impossible to pull away from its rambling, feverish, almost stream of consciousness narrative. Poet, punk, philosopher, she truly became a rock n roll star with “Because the Night.” And then, the retreat. A backing away, or perhaps a re-direction of her energies, until a series of critically rated new work and a terrific book Just Kids. I’d never seen Patti live, so the chance to see her in a relatively intimate environment (apparently the AGO holds 400 or so people) was a real draw. The tickets sold out immediately. I arrived at the AGO at 6:00 about half an hour before the doors opened to find a line-up. Eventually we got inside and staked out a place. Our ticket was upstairs (obstructed), but we managed to find a place where we had a great view (basically behind her left shoulder). And we waited. Patti took the stage about 7:30 along with her guitarist Tom Shanahan and her daughter Jessie Paris Smith on piano. What followed was an intimate seventy minutes of music, poems and conversation. In my post about her photography show I used the word interesting to describe Patti Smith and her life. Fascinating might be a better choice. Patti played nine songs, read excerpts from her book, a poem and a letter to Robert Mapplethorpe. It’s hard to please every one, especially when you have a long career. Me? I would have been happy if she had played all the hits, but I’m glad she didn’t because it would have felt like a nostalgia tour. An artist moves on. Patti played a selection (see below) from her career. She talked about her friends. She stumbled. She had trouble with a microphone. She was human. And it felt as if we were part of a small coffee-house affair with a good friend we hadn’t seen in a while. A memorable evening. S-21 was the name given to a former high school in Cambodia transformed into an execution centre by the Khmer Rouge. The camp operated between 1975 and 179 when the Khmer Rouge was overthrown by the Vietnamese army. An estimated 20,000 people were executed there. Yesterday, I went to the Royal Ontario Museum’s exhibition of photographs from the camp. Unlike many of the camps, S-21 maintained detailed photo archives of its prisoners although the identities of the majority are unknown. It’s eerie looking at the photos. In some ways they resemble nothing more than standard police mug shots but there’s a chilling sense as you realize that within a few months of these pictures being taken the subject would be brutally murdered. What’s strange though is the lack of emotion in the pictures. Only one man has anything like a smile. Most wear what might be called resignation. It’s said that like Saturn a revolution devours its own children, but the gluttony for murder seems unsurpassed.